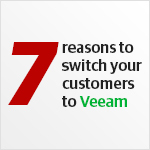 Thousands of your customers already applied for no-cost usage for six-months of Veeam® Agents for Microsoft Windows and for Linux or Veeam Backup for Microsoft Office 365. Don’t lose time and follow up with them NOW to upsell when the free period expires. Or use this offer to convenience your prospects and help sell Veeam flagship products* whilst removing pricing objections and competitive pressure so you can win more deals –– faster! Tell your customers and prospects about this offer today. Veeam has built a program to make the shift to the cloud not only seamless and exciting for your customers, but profitable for you by offering €750 in FREE cloud backup and DRaaS. Use this program and get a long-term profit with a bigger revenue stream! Grow your cloud business by telling your customers about this offer now! 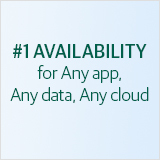 Earn big with the special Veeam Backup Essentials Offer! Only until Dec. 15, 2017, earn up to 15% more on each license of Veeam Backup Essentials™ Enterprise or Enterprise Plus with additional years of maintenance. Help your customers get the #1 VM Backup™ and Availability for small business and earn more! 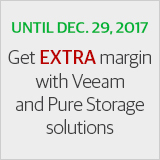 Only until Dec. 29, 2017, get up to 10% extra profit on each deal when selling Veeam & Pure Storage Together and ensure your customers get accelerated performance and Availability for the Always-On Enterprise™! *Valid for a selected number of customers. Please check the eligible ones with your renewals representative. Innovation, simplicity, customer satisfaction, reliability… what else? Check top Veeam advantages over legacy backup and switch your customers to the stable, multi-cloud focused, high performance solution today! 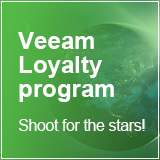 Our Veeam partner loyalty program rewards star partners like you! Participate in this program by completing Veeam sales and marketing activities, get points and exchange them for great prizes! Effective Jan. 1, 2018, the 25% reinstatement fee that currently applies to contracts expired for more than three months will be changed to one month after the support expiration date in addition to the regular annual maintenance cost. Effective Jan. 1, 2018, our maintenance renewal pricing will be adjusted. This will impact your customers on the date their contract expires. Please advise your customers how they can lock in their current support contract today at a discount. Questions? Contact your renewals representative. Special offers are valid for EMEA only. Special conditions may apply. Visit the promo web pages to learn more or contact your channel representative.